Image caption When the only interaction is with a machine, shopping can be a "miserable experience"
Automated checkout machines put off about a quarter of older people from going shopping, a survey from a housing charity for the elderly suggests. They can find the automated checkouts "intimidating" and "unfriendly," according to the charity, Anchor. Without someone to talk to at the tills, shopping can be a "miserable experience," a spokesman said. The British Retail Consortium said it was important for shops to be welcome destinations for all of the community. The lack of seats in shopping centres or on High Streets can also make older people feel "shut out", according to the charity. 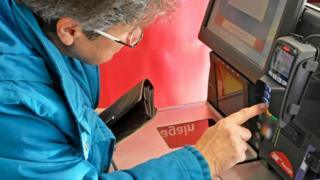 It also warned that automated checkouts could add to loneliness and isolation among the elderly. "There was a time when people knew their shopkeepers and could pass the time of day. You can't do that with a machine," says Mario Ambrosi, a spokesman for the charity. The report from the charity, produced by the Centre for Future Studies consultancy group, says there is a "dire need for the High Street to re-invent itself" if it is going to be accessible and attractive to older people. The study suggests 24% of older people are deterred from shopping by automated checkouts and 60% are worried that there will be a lack of seating if they need to rest. With rising numbers of older people, the charity says that by the end of the next decade retailers could be missing out on £4.5bn per year if pensioners stay away from the shops. "The technology needs to have some human interaction, it's what gets people into the shops," says Mr Ambrosi. He says there are still "significant numbers" of older people who are not online and depend on going to the shops - but who find the experience uncomfortable. For the automated checkouts, he says people might feel under pressure "if they don't respond quickly enough" to the instructions. It also might mean "they can have gone shopping without having said 'hello' to a single person - and that's quite a miserable experience," he says. Daphne Guthrie, who is approaching her 93rd birthday, says across her lifetime she has seen a complete change in shopping culture - from small, privately owned stores, where shopkeepers knew their customers, to impersonal megastores. Image caption "I wouldn't want everything to be automated," says Daphne Guthrie. Mrs Guthrie, from Market Deeping, in Lincolnshire, says she would always choose a till with a human and has never tried the automatic checkouts. She would like shops to be more welcoming to older customers and shopping centres to be less harsh environments for people who might want to stop and chat, particularly those who might not get to talk to many people. "They should be more friendly - treat me as a person and not just someone who pays the bill. The Campaign to End Loneliness has warned of an estimated 1.2 million people in the UK who have "chronic" loneliness. The campaign has highlighted that automated checkouts have shut down what might be some people's only chance to talk to someone during the day. Anchor is also promoting the Standing Up 4 Sitting Down campaign to improve seating in shops and the High Street. A spokeswoman for the British Retail Consortium said shops had been trying to incorporate more seating to "ensure everyone can have an enjoyable shopping experience". "As high streets continue to evolve, it's increasingly important they are welcome destinations for people of all parts of the community." But the increase in automation and self-checkout machines is about costs, the retailers' group said, reflecting the "diverging costs of labour versus technology". Caroline Abrahams of Age UK said: "Clearly there is no single 'older consumer' - people in later life are incredibly diverse in terms of their interests, income and health. "That's why it's vital that shops and companies do not stereotype their older customers, whilst also being aware of the ways in which some might need a bit of practical support." Martin Tett, the Local Government Association's environment spokesman, said councils understood how "crucial it is that all members of our communities can play a role in our civic life, and that includes making sure our high streets are as accessible as possible". He said that councils could support partnerships to "support dementia-friendly communities or age-friendly cities".